Late-Night Lawmaking. Trips To New Orleans. And A Proposal To Ease Casino Regulations. 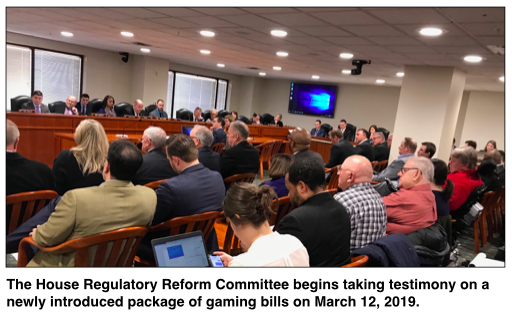 LANSING (April 4, 2019) — Amid increased lobbying by casinos and trips to New Orleans for a gaming conference, key state lawmakers have been quietly backing bills that would weaken regulations on the state’s casino industry. According to the conference’s nonprofit organizers, those at least registered to attend the January event included the incoming speaker of the House, committee chairs and the sponsor of gaming bills that were vetoed in lame duck and of new ones introduced in 2019. While the conference was described as a way to exchange ideas with lawmakers from other states, members of the Michigan contingent were eligible for up to $900 in travel reimbursements, according to organizers. The situation shows how little is sometimes known publicly about policy decisions made in Lansing. The trips to New Orleans didn’t have to be disclosed (MCFN found out about them through sources with knowledge of the trips). The casinos have reported few specifics about their intensifying lobbying. And some lawmakers have acknowledged knowing little about the gaming bills they voted on at the end of 2018. One legislator, Rep. Gary Howell, a Republican from North Branch, said even the “most conscientious person” could not have read all of the 400 bills the House and Senate sent to Gov. Rick Snyder in lame duck, the period from the November election until the end of the term. Howell has proposed ending lame-duck sessions altogether. The original gaming bills received their final House vote at about 3:30 a.m. on Dec. 21, 2018 — the final day of the 2018 session. State lawmakers overwhelmingly approved the package. Much of the attention focused on a proposal to allow online gaming and to tax it. But the package also included a 95-page bill that would have eased a number of regulations faced by the casino industry. 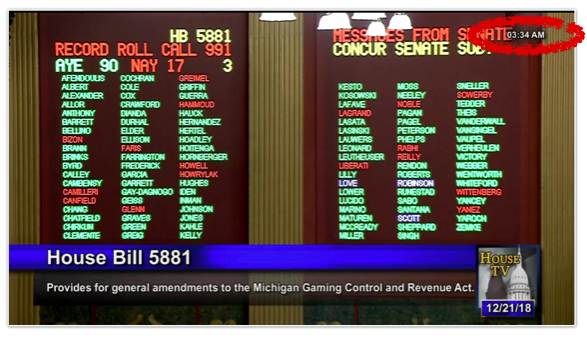 The final version of the bill posted on the Michigan Legislature’s website could also limit the public’s ability to find out whether government officials or their relatives are financially connected to casinos their policies regulate. 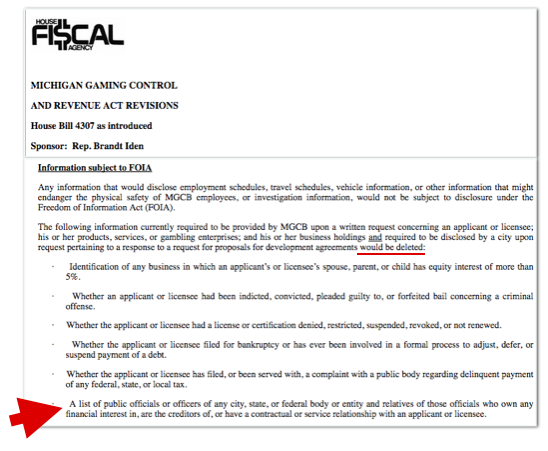 The bill from lame duck would have deleted a requirement that the Michigan Gaming Control Board disclose the names of government officeholders with financial interests in casino operations or applicants for licenses, according to the Legislature's website. Asked about taking out the requirement that public officials’ casino connections be disclosed, Rep. Brandt Iden, a Republican from Oshtemo Township and the bill’s primary sponsor, indicated the language wasn’t in the final version of the bill that the Legislature sent to Gov. Rick Snyder in 2018. Later, MCFN sent a copy of the final version of the bill that’s available on the Legislature’s website to Iden’s office for an explanation. No one from the office responded. According to the House Fiscal Agency, that specific disclosure requirement would also be deleted under the new bill Iden introduced this year. 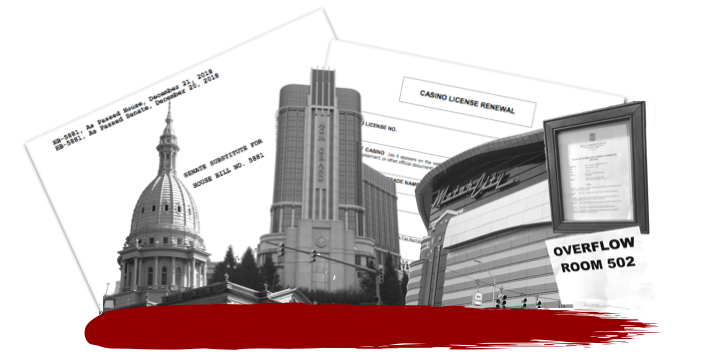 Citing the current law, which the bill would have changed, MCFN requested information on current casino licensees’ connections to government officeholders and received information about all three casinos in Detroit. The Michigan Gaming Control Board provided information from original applications in 1998. You can view the documents by clicking here. MCFN has submitted another request for current information, which hasn't been fulfilled yet. Overall, Iden said the gaming proposal was meant to update and modernize a law that was written 21 years ago and that some view as unnecessarily strict. During a House committee meeting this month, Michael Neubecker, president of the MGM Grand Detroit, told lawmakers that changing the licensing regulations would create opportunities for more people to work with the three Detroit casinos. The changes would also make it easier for small businesses to become licensed suppliers for the casinos, he said. “Right now, the licensing component can be exhaustive,” Neubecker told the committee. 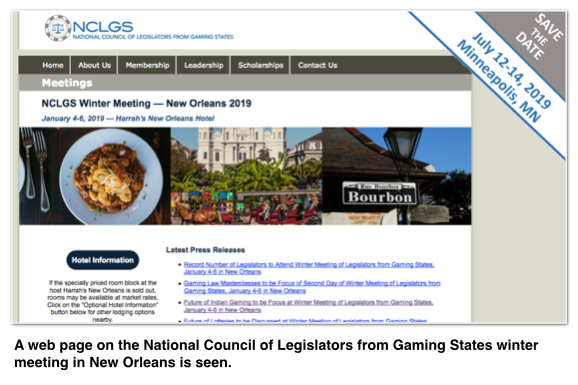 A week later, seven Michigan GOP lawmakers were registered to attend a gaming conference in New Orleans, organized by a New Jersey-based nonprofit called the National Council of Legislators from Gaming States, according to the nonprofit. At the request of MCFN, the council voluntarily released the names of those registered to attend from Michigan: Iden, the sponsor of the 2018 gaming bills; new House Speaker Lee Chatfield; Rep. Mike Webber, the new chair of House Regulatory Reform Committee; Sen. Aric Nesbitt, the new chair of the Senate Regulatory Reform Committee; Rep. Matt Hall, a member of the House Regulatory Reform Committee; House Speaker Pro Tem Jason Wentworth; and Rep. Jim Lilly. The regulatory reform committees usually handle bills related to gaming. Only Iden confirmed to MCFN in an interview that he indeed attended the event so it's unclear whether the other lawmakers ended up attending. And none of the other lawmakers responded to requests for comment. According to an agenda posted online, the conference went from Jan. 4 through Jan. 6 (Michigan's first legislative session day of 2019 was Jan. 9). The conference featured sessions on various gaming issues, a reception, a keynote address from former New Jersey Gov. Chris Christie and an “optional back-of-house tour of Harrah’s New Orleans Casino,” where the conference was held. Ohio state Sen. William Coley, the current president of the National Council of Legislators from Gaming States, said the events aren’t about lobbying lawmakers to vote a certain way. The organization has members that are both pro-gaming and anti-gaming, he said. “Our job is to try to get the truth so you can create some good public policy,” Coley explained in an interview. A list of sponsors on the organization's website includes multiple companies that offer gaming products and companies that operate casinos. It's unclear whether trips to the conference will influence any lawmaker's decisions on upcoming legislation. Iden was scheduled to moderate a discussion on “emerging forms of gaming,” according to the agenda online. Iden said in an interview that he’s been working on gaming legislation for three years and as someone at the forefront of the discussion, he makes sure to be engaged with individuals in the industry. Iden said he paid out of pocket to attend the conference but declined to say whether he would seek reimbursement from the organization for his travel. After Snyder's veto, lawmakers unveiled a revised package of gaming bills for the 2019-2020 session in March. Iden and others are hoping they can get the new bills through the Legislature and signed by the new governor, Democrat Gretchen Whitmer. The new bills include a provision that would allow those with financial interests in casinos to begin making campaign contributions at the state level. One of the bills alters a law that was originally put in place through a ballot proposal, so it would require three-fourths support in both the House and the Senate to become law. In 2018, House Bill 5881, which would have weakened several regulations faced by the casino industry, passed the House overwhelmingly in a vote of 90-17. But that doesn’t necessarily mean all of the lawmakers knew what they were voting on. When MCFN asked eight lawmakers about the provisions of lame duck's House Bill 5881 over the last weeks, most of them couldn’t answer specific questions about changes in the bill or why the changes were being proposed. Rep. Gary Howell, a Republican from North Branch, said he voted against the bill simply because it allowed for more gaming in Michigan. Some of the lawmakers were aware of only portions of House Bill 5881, like the fact that it would allow people previously convicted of felonies to begin getting casino licenses or supplier licenses in certain circumstances. Rep. Yousef Rabhi, a Democrat from Ann Arbor who voted against the bill, said the bill had been promoted by some as a social justice measure because of that provision. Rabhi said he has taken a “nuanced” approach to the proposed gaming changes. Rabhi said he wants to ensure that the gaming rights of the tribal nations in Michigan are protected. Then-Rep. Martin Howrylak, a Republican from Troy, said the 2018 bill was marketed among Republicans as being “very technical.” Howrylak said he got to the point with the bill where he knew enough that he also knew he couldn’t support it. “I just felt there wasn’t a problem being fixed,” Howrylak said. The state’s three Detroit casinos all increased their spending on lobbying in 2018. 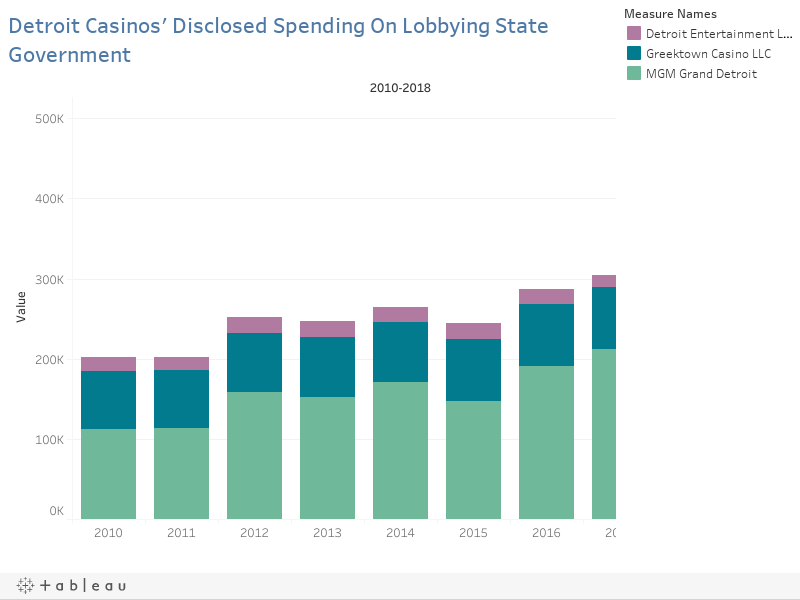 For each of the three casinos, the disclosed spending total for 2018 was the largest total for longer than a decade. In Michigan, lobbying is specificaly the effort to directly communicate with officeholders to influence their positions on bills or proposals. It doesn’t include political contributions. MGM Grand Detroit increased its disclosed spending on lobbying by more than $150,000, from $212,509 in 2017 to $388,369 in 2018. Greektown Casino increased its disclosed spending on lobbying from $77,040 in 2017 to $90,420 in 2018. And Detroit Entertainment LLC, which owns the MotorCity casino, increased its disclosed spending from $14,350 in 2017 to $22,952 in 2018. As for which lawmakers benefited from the increased spending the most or which were targeted by the spending, it’s impossible for the public to tell. Detroit Entertainment, Greektown and MGM didn’t disclose purchasing any meals, trips or other perks for specific lawmakers. All three are represented, at least in part, by multi-client lobbying firms that advocate for a laundry list of different interest groups and businesses while having to disclose little information about their efforts on behalf of specific clients.